1.Kxb6? f5 2.Kc5 e4 3.fxe4 f4! wins, as White cannot prevent …f3. 2.Kd5? e4 3.fxe4 f4! 4.e5 f3 5.e6 fxg2 6.e7 g1Q 7.e8Q+ Ka7 draws. 2…Kb8 3.b4 Kc7 4.Kb3! White can never play Kd5, so the only way to win is to go backwards to d1. 4…Kd6 5.Kc2 Kd5 6.Kd1! Now White is threatening 7.f4. 6.Kd2? 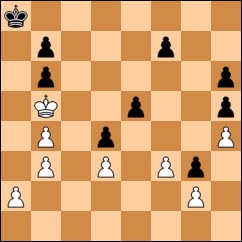 gives Black an important tempo because an upcoming …e3 will be with check: 6…e4 7.dxe4+ fxe4 8.f4? (8.fxe4+ draws) 8…Kc4 9.f5 e3+! 10.Ke2 d3+ 11.Kxe3 Kc3 wins. The other way to prevent 7.f4 is to play 6…f4 , but now that …e4 is no longer possible, White can go back to d5: 7.Kc2 Kd6 8.Kb3 Kd5 9.a4 Kd6 10.Kc4 Ke6 11.a5 bxa5 12.bxa5 Kd6 13.a6 bxa6 14.bxa6 Kc6 15.a7 Kb7 16.Kd5 wins. 7.dxe4+ fxe4 8.f4! Now Black cannot stop both the f-pawn and the a-pawn. 8…e3 9.f5 d3 10.f6 Ke6 11.a4 Kxf6 12.a5 bxa5 13.bxa5 Ke5 14.a6 bxa6 15.bxa6 Kd4 16.a7 e2+ 17.Kd2 wins.